(1) Obama and the Castros are all by-the-book/Manifesto, dyed-in-the-wool Marxist-Leninists. No one doubts that fact about the Castros. Although Obama cannot, politically, unmask himself and explicitly announce that fact, he has actually done the equivalent: apart from the facts that every action he has taken in every elected office he has held has been consistent with that ideological commitment, and that his every single, known personally-close associate throughout his life has been a very-radical leftist, including genuine, publicly-acknowledged Marxist terrorists, he also was a red diaper baby who, in one of his two autobiographies, explicitly acknowledged his political mentor to be one Frank Marshall Davis, a real, life-long, card-carrying, anti-American, Stalinist Communist. Other than those rare souls, like Whittaker Chambers and David Horowitz, who explicitly renounce, and turn against, communism, once a Commie, always a Commie. Absolute loyalty to the transnational Communist revolution is the very reason Obama has lavished such otherwise utterly-inexplicable attention and largesse on the Castros. (4) The (narcissistic/sociopathic) desire of each Marxist dictator to be acknowledged as supreme — and to be The One (they’ve been waiting for) who finally conquers their Cause’s eternal, transnational enemy, the U.S. According to American media, Obama’s trip’s strategic purpose supposedly was both to further the liberation of the Cuban people, and to welcome Argentina and its recently-elected president back into the world of free markets and the rule of law. Nothing could be further from the truth, as Obama’s actions in both those countries prove. First, note that since announcing his unilaterally-made, 180° change in America’s Cuba policy (from targeting a terrorism-sponsoring, evil, enemy, spying, mass-murdering robber to Obama’s new best buds in the hemisphere), Obama and his administration have focused vastly more attention, interest and time on that destitute, totalitarian prison-island’s dictatorship (not its dissidents) than, for example, on Israel and all European nations combined, notwithstanding the fact that each of those real, long-standing allies of ours have been suffering particularly massive, Islamist terrorist attacks, with America providing ostentatiously-limp, lip-service-only sympathy, even though America has supposedly been engaged in war in Syria and Iraq against the very-same known source of all that European terrorism. Throughout the time of the new Cuba policy, Obama has been claiming to be magically promoting the interests of the enslaved Cuban people with his complete surrender (that being his entire Cuban policy) of all previous demands for concessions from Castro to promote their liberty, as mandatory prerequisites for any easing of the trade embargo, demands which America has maintained as its sole leverage for that purpose ever since Democrat-hero JFK instituted it (as part of his pretend-toughness, after his now-known, then-secret — except to our enemies! —major strategic capitulations described below). The Castros have, with great particularity, “named” our embargo the American “Blockade [sic].” And that particular term has been pregnant with meaning in all their propaganda for decades. Specifically, the Castros have, with that Marxist Big Lie (there is no American blockade) doublespeak, pretended that America’s Cuban policy has been a continuing, bullying act of war, and that it alone has been the cause for supposedly-egalitarian, utopian Cuba’s obvious utter misery ($20 per month is the highest legal Cuban salary — except for the ruling thugs who, as in all communist tyrannies, are “more equal” than the slaves they rule over/own). In fact, every nation on the planet, other than the U.S., has been perfectly free to engage in any trade they like with Cuba – without the slightest interference from the U.S. But like all Communist dictators crushing their country, Castro always needs someone to blame – and hate. And as a true Marxist purist, Castro has always picked America as that someone. Obama has simply been unique among American presidents in agreeing with Castro – on everything. Just one week before Obama flew down, Castro had a particularly-large, even for him/them, number of dissidents arrested and brutally assaulted, including many of the highly-visible Ladies in White – widows and wives of political prisoners brutalized and/or killed in Castro’s horrific political prisons. One Lady in particular managed, at great risk, to get her story out — mere days before Obama’s arrival: she had been gratuitously arrested and brutally hand-cuffed (harming her wrists) by Castro’s thugs, stripped naked in front of multiple men (i.e. sexually assaulted), and thrown naked onto the floor of a jail cell. Even without Castro’s in-advance demand that Obama meet only with “approved” dissidents, that particular known atrocity — among many others — alone should have been enough for any American president to cancel his trip. Instead, Obama (flauntingly) humiliated the U.S., that Lady, and all Cuba’s other dissidents, and happily went there, just as scheduled, officially legitimizing the brutal tyranny – even after Fidel insultingly announced his refusal to greet him at the airport! And, after landing, there Obama stood, on camera, nodding in agreement, while Raul Castro delivered his typical, sneering slander of America, including, of course, his denouncing, in particular, the “Blockade [sic]“ as the sole cause of all otherwise-utopian, egalitarian Cuba’s failures – thereby securing Obama’s explicit, public, nodding agreement with all that anti-American fraud, including the ”validity” of Castro’s use of that particular term. 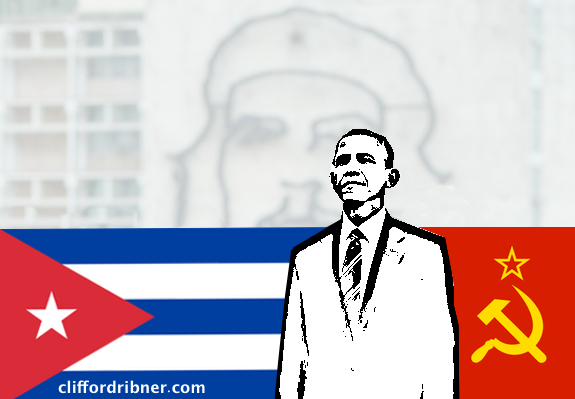 Obama, who has complete control over such things, arranged to have the signature photo of his entire visit be a picture of him, standing in solidarity with Cuban Communists, in a square devoted to celebrating Cuba’s Marxist revolution, with the entire background a multi-storey, stylized portrait of the sadistic Marxist terrorist murderer, Ernesto “Che” Guevara, with Obama gazing off in revery, his hand on his heart, basking in the anti-American diatribe – obviously in complete agreement with it. Obama well-knew that Cuban TV would only show the Cuban people/slaves those images of him blessing their revolution/masters and agreeing with all Castro’s anti-American insults and blame – and also that, whatever meek, almost-criticism (for the American public) of the Cuban Communists he might offer in his own speech, the Cuban people would never be permitted to see it. As further detailed below, Obama’s unspoken, FLAUNTING, principle message — to the World — in Cuba was that he alone had conquered America’s supposed past Capitalist, Colonialist, Racist evil, and replaced all its old, passé values (he loves to talk about “Our values,” always actually referencing only those of Marxism) with those of Communism – claiming the mantle of the virtual Marxist Messiah in that respect. And it seems that was just a bit too much for Fidel, who always had proclaimed himself the master Communist in the West. And so Fidel wrote his editorial, providing the trip’s final, post-script, word and, addressing “Brother Obama” therein, made sure to emphasize America’s eternal evil — and his own, singular role as its eternal chief opponent. He just couldn’t stand to be one-upped as the Primo Marxist enemy of America by that black (Castro hates Blacks) upstart. That was his FLAUNT. In Argentina, Obama made a (flaunting) point of emphasizing, and apologizing for, America’s supposed, neo-colonialist complicity in an earlier dictatorship’s assaults on the Argentine people, and promised to declassify documents concerning all that which we “secretly” possess. He then publicly declared (flauntingly) that there is, after all, no substantive difference between communism and capitalism (now that he has defeated the U.S, the home of the latter, he left unsaid) and that both, equally, have good points (no mention of Communism’s slavery, gulags, torture, and its at least 80 million murdered) – and cheerfully and publicly danced the tango, in ice-cold, contemptuous indifference, immediately following a horrific act of mass-murder terrorism in our supposed ally Belgium’s Brussels — literally the capital of (colonialist) modern Europe. Score another anti-colonialist, Marxist FLAUNT for him. Briefly, THE FLAUNT has always been Marxist revolutionaries’ favorite way of showing their utter contempt for their opponents – and to pretend that they are SO COOL. It is the proverbial spit-ball, the finger in the eye, the prominently-displayed middle finger in the air. It is why Marxists and fellow-travelers have so especially adored Guevara — not despite his having gratuitously and personally killed scores of innocents, and proudly exclaimed his sadistic relish in doing so, but because of that, coupled with his rakish beret and beard in all his photos, all showing how HIP he was — and how worthy, therefore, of being lionized by all who think they are free-spirit rebels at heart (never mind that their revolution, when successful, as in Cuba, ends all individual liberty). And that is precisely why Obama picked that spot for his crowning-glory photo op in Cuba – in front of Guevara’s gigantic Cuban shrine. Wow, far out! An American president Che fan grooving in Havana. Dig it, man — the all-time Primo anti-American FLAUNT! But there was more. Obama’s entire trip was also his FLAUNT for having personally reversed America’s entire anti-Communist policy in the Americas, paying respect to the previous Communist exporters of revolution there – both Guevara and Castro – and flauntingly dishonoring America throughout. First, of course, the immediate strategic backdrop of the trip was the fact that Obama’s policy in Cuba deliberately promises succor and enrichment for the Castro brothers’ kleptocracy – the sole owners of all wealth in that nation – rescuing them from the very brink of their previously-imminent implosion due to the loss of their previous, essential, financial benefactor, Venezuela, whose own bankrupting Marxist hell has resulted in its inability to continue to fund the eternally-bankrupt Cuban revolution, even with thousands of armed Cuban thugs/terrorists assaulting and killing dissidents in Venezuela, keeping its Marxist president Maduro in power. Castro established his absolute military dictatorship — a revolution backed by the USSR, actually beginning in the 1940’s — over Cuba in 1961. Ever since then, Communist Cuba has constituted a continuing, grotesque – and extremely dangerous – insult to the Monroe Doctrine’s policy. That policy has, since 1823, defended us by explicitly declaring that the United States will militarily-prevent any foreign power, let alone an ideologically-sworn enemy, from even attempting to interfere politically anywhere in the Western Hemisphere and, necessarily, will militarily end any colony or dependency such a power may succeed in establishing. 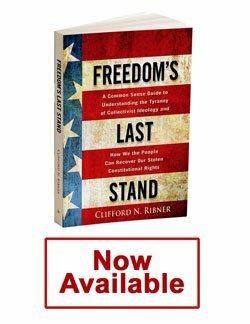 That Doctrine had been respected/feared by the USSR, until massive US military irresolution was broadcast, first from multiple strategic failures by Eisenhower (most-notoriously, his refusal to fight to win the Korean War, and his stabbing major allies in the back in the Suez affair) and, even more dangerously, from Kennedy’s refusal to reinstitute the then-frayed Doctrine by resolutely making the Bay of Pigs invasion the success it easily could have been — instead of the notorious, bloody fiasco of betrayal of our Cuban fifth column allies. As a completely-dependent Communist puppet of the USSR from the day Castro seized power – a fact known even before the USSR incontrovertibly proved it in 1962 by entrusting Cuba with custody of its own strategic nuclear weapons – Communist Cuba’s very existence was a frontal assault on that Doctrine: the United States has never faced any enemy as existentially-dangerous as the nuclear-armed USSR. Additionally, Castro’s Cuba by itself constituted a direct violation of the Monroe Doctrine simply because its rigid, doctrinaire Marxism itself always required its absolute enmity towards the United States. And that was true even before Cuba became the USSR’s very-active hemispheric instrument here, infesting all the Americas with its transnational Communist malignancy through espionage, terrorism and revolution-incitement. To his shame, Pres. Eisenhower failed to lift a finger to oppose Castro during the eight years prior to 1961 – when it would have been easy to do so. Although Castro had been superficially coy about his politics during that period, anyone who paid the slightest attention would have known him to be a Communist whose pretense at being something else was akin to Mao’s identical, pre-victory fraud (“I’m a humanist,” they both had said). Immediately upon seizing power, Castro and his fellow murderers, prominently including Che Guevara, killed everyone in sight whose loyalty to the Communist cause was not certain, and ruthlessly stole all property from its owners in Cuba, including extensive property owned by Americans. They have never moderated their totalitarian brutality, and have never paid a cent for their thefts. Contrary to the fraudulent myths about the 1962 so-called “Cuban Missile Crisis,” myths propagated and spread by Robert Kennedy in his self-serving, fictional “autobiography,” and by other sycophantic Kennedy myth-spinners, including Sorensen and Halberstam, rather than being a great show-of-strength victory for the US, that entire episode – which was genuinely-terrifying to all Americans while it was occurring – resulted in genuinely catastrophic strategic defeat for the US, further emboldening the USSR. If what I just said seems surprising to you – and directly contrary to everything you have been told – that is because the Kennedy administration was so successful, for so long, in hiding the truth about both what they actually agreed to which resulted in the USSR’s removal of its nuclear weapons then in Cuba, and what the USSR’s strategic objectives – made clear in its written demands to the Kennedy administration – had actually been in bringing those missiles to Cuba in the first place. Specifically, the USSR had two, and only two, strategic objectives (it would have been militarily-crushed at that time in any actual nuclear exchange with us, and so had no interest then in that as an objective) which it wanted to achieve: (1) for the US to remove its strategic Jupiter missiles from Turkey, where they directly-threatened Moscow and numerous Soviet missile silos, and (2) to secure Communist Cuba from the invasion, then still required by the Monroe Doctrine, by the US formally ending that Doctrine, at least with respect to Cuba, and renounce any intention to ever invade it. It withdrew its missiles from Cuba when, and solely because, it achieved both of those strategic objectives. — requiring major capitulations by the U.S.
And, because of the Kennedy administration’s duplicity in preserving its own, but not America’s, political face, it successfully hid for over one decade its deliberately-private promise to the Soviets to remove the Jupiter missiles. That fact of the Jupiter missile capitulation was not made top-secret and hidden from (most of) the world for any actual national security reason: because the Soviet enemy of course knew all about it. The only ones kept in the dark were the American public. And that particular public-secrecy/duplicity, expressly demanded of the USSR for their own, selfish personal reasons, by the Kennedys as a condition to conclude the affair, further emboldened the USSR — because of the additional strategic weakness that their personal cowardice displayed. In Cuba, Obama’s most-important FLAUNT was his explicit declaration that his unconditional surrender, supposedly representing the US, of all previous preconditions to relations with Cuba actually constituted the true end of the Cold War. Clearly implicit in that his declaration was the notion that the Cold War — and the Cause of Communism — had survived the implosion of the USSR, in a clear effort by Obama to rewrite history, and end that War only with our surrender. He thus made clear that his deliberate humiliation of America was both public – unlike the Kennedys’ – and far more radically-humiliating than even the previous surrender of the Monroe Doctrine by them had been — rendering it the ultimate Marxist Victory – over America, Marxism’s eternal, declared enemy — and FLAUNTINGLY secured by Obama alone!